The whole team of DataFromsky is happy to announce that the Technological Agency of Czech Republic has supported our project in the international programme “Delta”. We have succeeded with a project called “Traffic management platform development for big social events using a drone based on visual sensing techniques”. The aim of the project is to develop an aerial artificial intelligence – a comprehensive mobile platform for real-time monitoring of traffic and big social events, using a UAV and advanced methods of computer vision based on artificial intelligence. The goal of is to develop a fast-deployable system for real-time surveillance of the defined area with automatic object recognition and classification, monitoring and automatic motion evaluation. Extracted image data will be analyzed in order to detect some nonstandard behavior, congestion, zone disturbance, and other user-defined parameters. Traffic data will be used for the immediate evaluation of traffic using simulations. 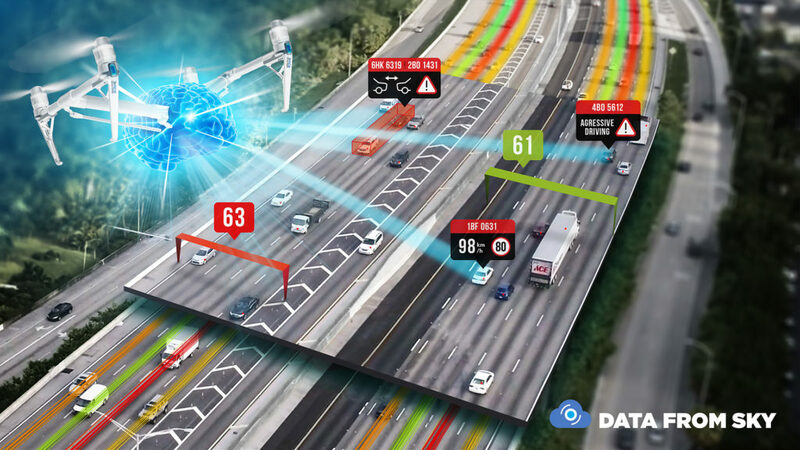 The system has a high potential of being deployed in the traffic monitoring segment (police drone) or in a security field. The novelty of the solution is in the implementation of intelligent UAV, which will provide information about moving objects during the flight operation, and interpret this data in the context of a particular application. This highly mobile platform is used wherever it is necessary to analyze the real-time situation. The project is a multidisciplinary task that combines the latest trends in mobile robotics (UAV), computer vision, and automated telemetry analysis. The system will be integrated into a higher unit to evaluate traffic situations and traffic plans based on simulations. © 2018 All Rights Reserved. Developed by RCE systems s.r.o.